A couple of weeks ago my brother-in-law & sister-in-law held a ‘125th’ party to celebrate their 50th birthdays and 25th Wedding Anniversary. 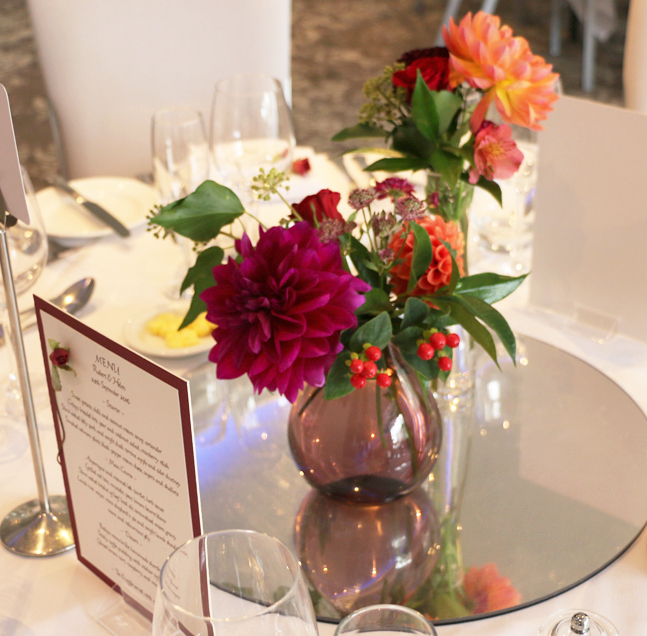 I was very happy to arrange their flowers and stationery. I am not a trained florist but have always loved flowers and many years ago took a short course with the well known florist Paula Pryke. I was keen to make sure the tables would befit their celebration. 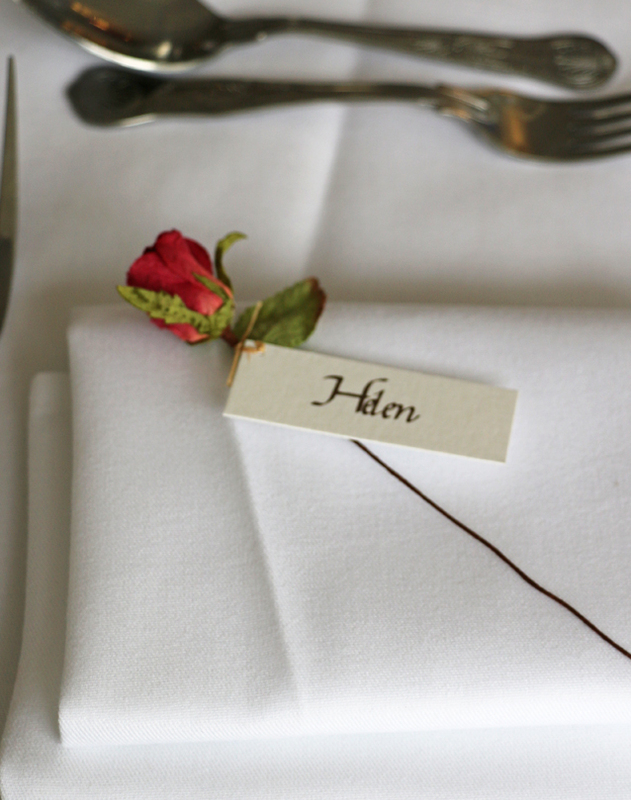 The theme started around red paper roses personalised with guest names, these make lovely keepsakes as well as doubling as name place settings. 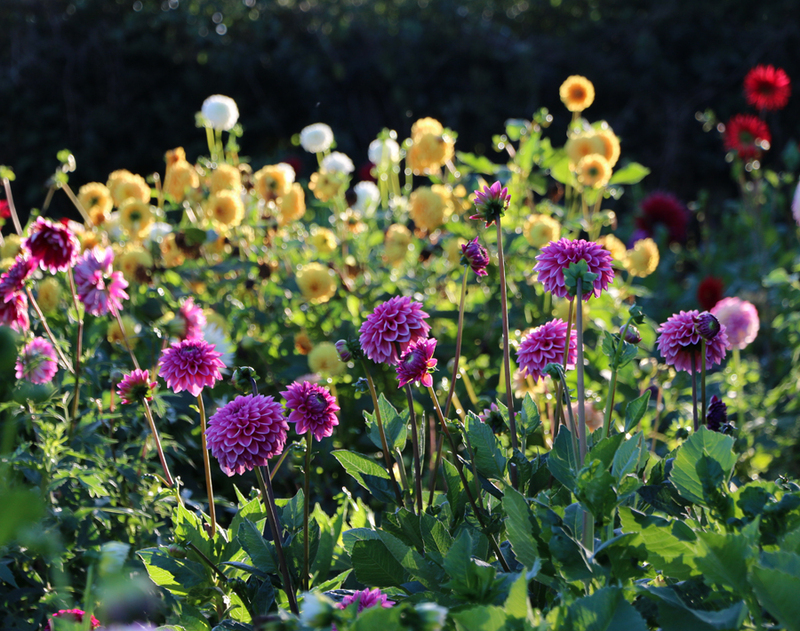 There is a small-holding of flowers and vegetables near to where I live and in September it is full with the most beautiful Dahlias. As the party was to be held in Autumn these would be perfect and the rich jewel like colours would mix well with the red roses. 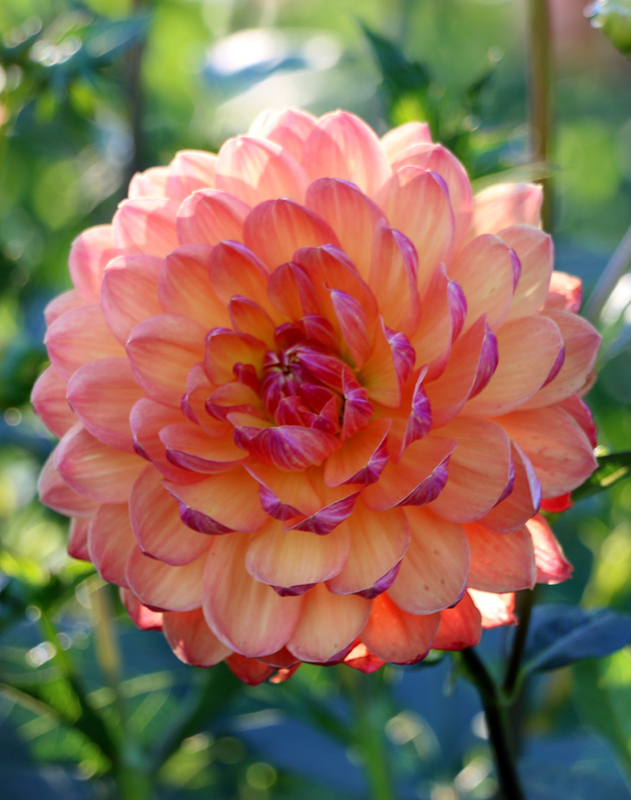 The grower, Stan, grows the Dahlias for shows and is very proud of the stunning blooms, he was happy to supply me some for the party. 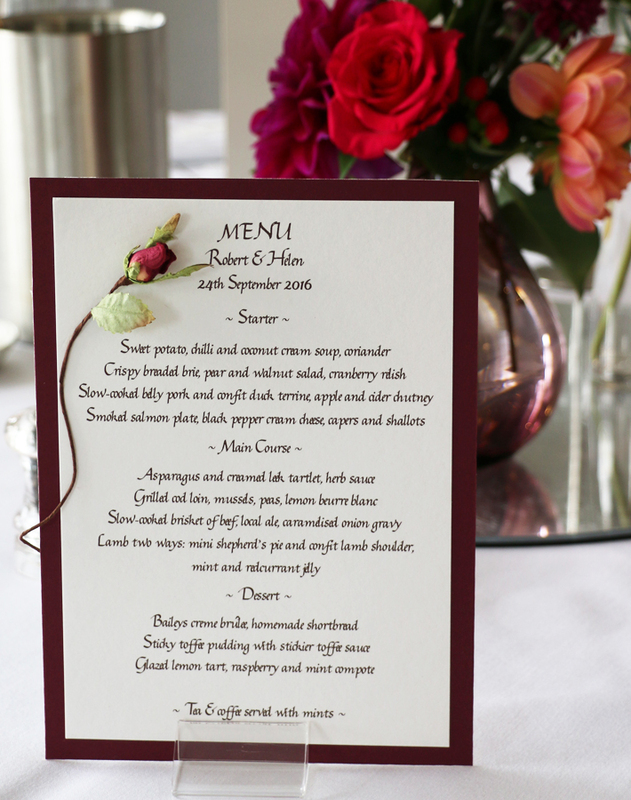 I designed some Menu cards to fit in with the rose place settings. My sister-in-law found some plum coloured vases at Ikea and I combined these with a bud vase and a silver votive to create a centre piece of 3 items. 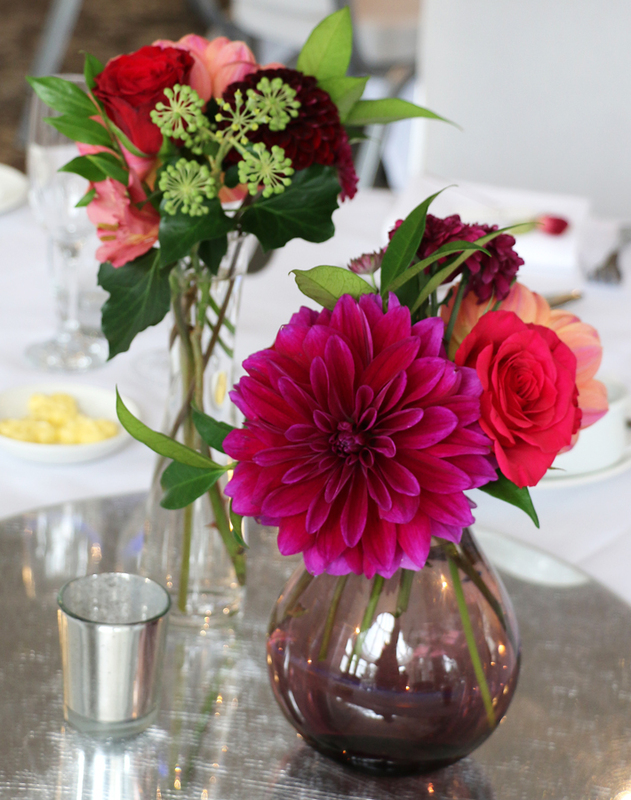 Added to the Dahlias were red & pink Roses, Ivy berry, Astrantia, Hypericum and Jasmine. It was a fantastic party for a wonderful couple & I was delighted to play a part in it. This entry was posted in Latest News, Uncategorized and tagged Paper Rose Place Settings, party decorations, table decoration. Thank you so much Ans for dressing the room so beautifully. I have had so much wonderful compliments about your stunning creations.